It's a little strange, a new Sepultura album without a Cavalera in the line-up. But with Paulo Jr., a member from start and of course Andreas Kisser there are still 2 of the 4 early members involved. After the 'Roots' album the popularity of the band never got to the same level again. This is their fifth record with Derrick Green on vocals, he has been a member for more than 10 years now, but it seems as if he just joined them yesterday. The new record is called 'A-Lex' which is a Russian expression of "no law". The record is again a concept album, this time inspired by the book "A Clockwork Orange". To me it doesn't matter if it's a concept or not, what counts is the music. 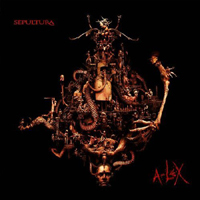 Sepultura gives us over 60 minutes of music and this is the first album with the new drummer Jean Dolabella. After a short intro the song "Moloko Mesto" kicks off, it's a fast and aggressive song with the groovy parts as we are used from the band. "Filthy Rot" has some Brazilian rhythms and is a rather strange song with community singing. The several songs that follow are rather mid-tempo and have the typical Sepultura groove in them. The speed returns again with the song "The Treatment". "Sadistic Values" is a slow and soft song which gets a little heaver in the end. "Forceful Behaviour" starts with nice guitar riffs and is one of the better songs. Derrick screams as if he is being hunted by a pack of wolves. Songs that are also worth to mention are: "Enough Said" and "Ludwig Van". This last song is an instrumental and I think you can guess what kind of music you can expect. Ludwig can be proud of and if he would not be rotten already, he would turn around in his grave from joy. Nice interpretation. The album could have done without all the A-Lex songs; they don't add anything in my opinion. Is this the record that will get Sepultura back in front? I don't think so, but it is a respectable album with enough good songs. Still the album needs to grow, the songs don't stick easy and perhaps that is the strength of the album. They did not convince me yet with this album, but maybe I think about it differently after a few months. Fans that dig the last albums of the band, don't need to worry and can buy this without a doubt.